Nothing better than a church and business mix. This is a sign that a downtown friend took for me on his phone. This is a new local church plant. Awesome. While I won’t claim to be doing it all right, I’m just fascinated at how many different things on this sign were the exact opposite of what we were going for in planting theStory. 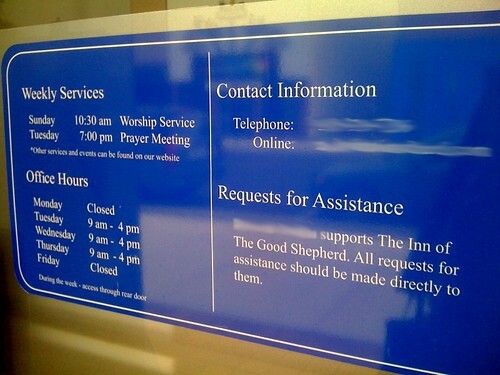 Don’t use the front door (because the completely non see through tinted windows for the entire storefront wasn’t enough), don’t ask for donations (our people tithe and we give the money to someone else to deal with you people), here is our hours (only come by at these times, and when you do, come to the back door), here is when the important stuff happen (Sunday services…all the other dribble can be found on the website)….and have a good week. Every church does things differently. Your church is not necessarily ‘holier’ or ‘superior’ to others. Why are you directing sarcasm and negativity at other followers of Christ? Paul doesn’t get it. Thank God we are way better Christians than he. haha.